Orimas Thila – Although sharks are not usually the highlight of the northern itineraries, Orimas Thila is an exception to the rule. Here, grey reef sharks can be observed circling and wriggling whilst they are being cleaned. The best spot to view them from is down-current either on the sandy bottom or from a ledge out of sight, kneeling or using a reef hook if the current is running. Fish Head – Fish Head also known as Shark Point or Mushimasmingili Thila, fits the classic definition of a Thila – a large isolated flat top reef rising sharply from the inner atoll floor at 40-50m to around 10m from the surface. It is one of the best sites for seeing populations of grey reef sharks and white tip reef sharks. Featuring a series of caves and overhangs in between where you can see thousands of blueline snappers against a backdrop of black coral bushes and large gorgonians. Rasdhoo Madivaru – Rasdhoo Madivaru Corner is located in the corner of the channel into the atoll. Madivaru has its fame amongst seasoned divers of the Maldives. It has one of the most spectacular and confusing reef formations found in Ari Atoll. Hammerhead sharks emerge in big numbers just before sunrise swimming in large groups. Dolphins, dog tooth tunas along with schools of black snapper are seen at the reef edge during the early hours. Divers get an opportunity to view white tip reef sharks, pelagics, trevallys, little tunas, jacks, ribbon eels, fish leaves tunas, napoleon wrasse and barracudas. Experience the thrilling scuba diving adventure amongst fine coral formations with highest underwater visibility. Miyaru Faru – Unsurprisingly given that ‘miyaru’ means shark in Dhivehi, sharks feature prominently at this North Male spot! At around 30 metres there is an overhang which can shield you from the strength of the passing current, and with an incoming current the visibility can be excellent and the parade of pelagic fish and local residents, impressive. You might see a number of grey reef sharks as well as barracuda, kingfish and tuna. Large groups of eagle rays and their larger cousins, the manta rays, are often seen here filter feeding in the plankton-rich water. Rasdhoo Madivaru – Rasdhoo Madivaru Corner is located in the corner of the channel into the atoll. Madivaru has its fame amongst seasoned divers of the Maldives. It has one of the most spectacular and confusing reef formations found in Ari Atoll. 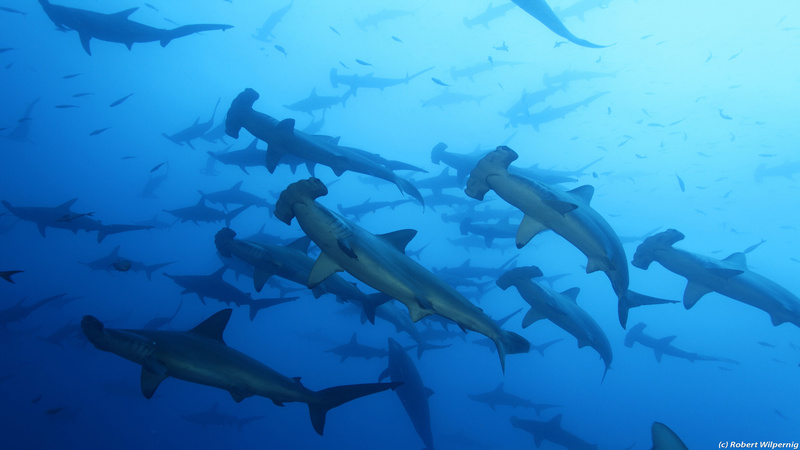 Hammerhead sharks emerge in big numbers just before sunrise swimming in large groups. Dolphins, dog tooth tunas along with schools of black snapper are seen at the reef edge during the early hours. Divers get an opportunity to view white tip reef sharks, pelagic fish, trevallies, little tunas, jacks, ribbon eels, fish leaves tunas, napoleon wrasse and barracudas. Experience the thrilling scuba diving adventure amongst fine coral formations with highest underwater visibility. Guraidhoo Kandu – Since the eastern side of the channel is open ocean, large predatory fish can regularly be spotted here. This site is famous for sightings of sharks, schools of eagle rays and the occasional sail fish and hammerheads. The best condition to do the dive is when the current is flowing into the Atoll. The dive begins on the outer reef following the current into the atoll. Most of the pelagic species can be observed on the eastern side, where the reef drops off into the deep ocean. At the end of the dive in the channel, along the reef you can find overhangs with plenty of soft coral growth and small fish. Kandooma Thila – Located in a channel, the reef is subject to strong currents at times. The ocean currents carry lot of nutrients to the reef, supporting an abundance of sea life. The site is well renowned for the soft coral growth, turtles, diverse fish life and invertebrates found on the reef. At the reef slope you may find sharks and eagle rays. Hanifaru Bay – is a marine protected uninhabited island located in the Baa Atoll of the Maldives Islands. Its size is no greater than that of a football field and yet it has become one of the hottest spots on the planet for underwater photographers. The reason for this modern day phenomenon of underwater diversity is because plankton blooms between the months of May and November – a very unusual phenomenon – attracting manta rays by the hundreds. At any one time at Hanifaru Bay, there can be up to 200 manta rays feeding off the coral reefs as well as plenty of whale sharks which do the same! Hanifaru Bay has become the world’s largest manta ray feeding destinations. PLEASE NOTE: From January 2012 scuba diving will not be permitted in Hanifaru Bay, however you will be able to snorkel in this area for a $20 fee (per person for approximately 45 minutes). Dhigala Haa – This beautiful thila in Baa Atoll is easily circumnavigated in one dive and is a favourite for shark sightings; often big numbers of grey reef sharks together. Once heavily fished, it is now a protected marine sanctuary and the fish life is prolific and varied with blue fin jacks, fusilier, blue striped and humpback snapper, batfish and schools of barracuda. Lhaviyani Atoll – Excellent channel diving in the north with sites closely located together. Lhaviyani Atoll hosts some of the Maldives wreck diving opportunities, including the two coral encrusted wrecks at ‘The Shipyard’ and the exhilarating drift dive of the Kuredu Express. A site suitable for the more experienced diver. Huvadhoo – is the second largest of the Maldivian atolls and the second largest in the world (in terms of overall surface area). It consists of a circular-shaped ring of reefs with a smaller, thumb-like, extension of at the northern end enclosing a deep central lagoon (up to 85 m in depth) that is studded throughout with numerous smaller patch reefs, coral knolls, faros and small coral islets. The outermost reefs of the atoll form a discontinuous barrier to the open ocean, made up from 40 reef segments separated from one another by deep passages connecting the open waters of the Indian Ocean with those of the interior lagoon, making for some fantastic diving and marine life sightings! Fotteyo Kandu – Many scuba divers consider Fotteyo Kandu to be the best dive site in the Maldives and it is also rated among the top 5 dive sites in the world. The mouth of the channel is exposed to the ocean and during northeast monsoon when the currents are incoming, a good variety of pelagic hunters gather at the entrance to the channel. Species commonly spotted here include grey reef shark patrolling the channel mouth, jack and tuna in the deeper water, schools of midnight snappers and red snapper form in huge groups. The wall features caves, overhangs and swim-throughs at different depths. These caves and overhangs are filled with colourful yellow colour like soft coral, deeper caves and overhangs are filled with huge bushes of black corals. Fushi Kandu – One of the most popular channel dives; although relatively shallow, it stretches for 250m and white tip reef sharks are frequent visitors, as well as schools of jacks, tuna and eagle rays. Olhugiri Kandu – Schooling fish and jacks attract large numbers of whitetip reef sharks. Tuna and eagle rays wait for the leftovers the occasional Napoleon wrasse can be seen nibbling on corals. Mulaku Kandul – The northeast is peppered with submerged pinnacles covered predominantly with soft corals, while the western part will see you surrounded by jacks and snappers. Keep an eye out for sharks and rays at 30m! Vaadhoo Thila – Found at the very south of the atoll just 13 miles north of the Equator, Vaadhoo Thila offers unspoilt reefs teeming with sharks. Sightings can include juvenile and adult tiger sharks, attracted to the area by channels leading in from the ocean. Maarehaa Kandu – One of the best dives sites in the Maldives for frequent shark sightings. This narrow channel is home to a fantastic array of marine life. Grey reef and white tip reef sharks are often spotted in large numbers, as well as eagle rays cruising by. Nilandhoo Kandu – A rarely dived site, the local marine population in the area has flourished. Visiting pelagic fish with barracuda, tuna and trevally are often seen here in healthy numbers. Diving here encompasses drift and wall diving, as well as deep diving. Keep your eyes on the blue, huge numbers of sharks have been known to congregate at this exciting dive site. Mattidhoo Reef – Mattidhoo Reef, on the other hand, is nestled within the protective inner atoll walls and makes for a stunning spot for the last dive of the day. Kooddoo Corner – The channels surrounding this dive site are home to unspoiled reefs that teem with fish life. Drift diving along on the current, large pelagic creatures are regularly sighted. Schooling trevallies, an array of colourful reef fish and the occasional Mola mola can also be seen at Kooddoo Corner. Book Your Maldives Liveaboard Trip Today!